Bob Woodward on "The Last of the President's Men"
In a free, public event Bob Woodward, the Pulitzer Prize-winning journalist and co-author of All the President's Men will introduce his latest book, The Last of the President's Men (Simon & Schuster; released October 13). 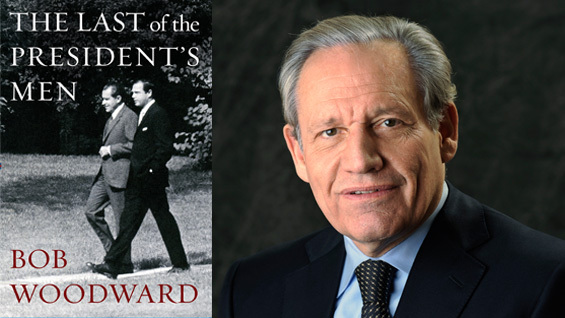 In the book, Woodward reveals the untold story of Alexander Butterfield, the Nixon aide who disclosed the secret White House taping system that led to Nixon’s resignation. In 46 hours of interviews with Butterfield, supported by thousands of documents, many of them original and not in the presidential archives and libraries, Woodward has uncovered a new dimension of Nixon. Butterfield provides the intimate details of what it was like working and living just feet from the most powerful man in the world as he sought to navigate the obligations to his president and the truth of Nixon’s obsessions and deceptions. Bob Woodward will discuss the book and other questions with Timothy Naftali (at left), former director of the Richard Nixon Presidential Library and Museum, who oversaw the opening of that museum's revamped Watergate Gallery. Bob Woodward has worked for the Washington Post for 44 years, where he is now an associate editor. He has won nearly every major journalism award and shared in two Pulitzer Prizes—for the Post’s coverage of the Watergate scandal with Carl Bernstein and as lead reporter of the coverage of the September 11, 2001 terrorist attacks. All 17 of the books he has authored or coauthored for Simon & Schuster have been national nonfiction bestsellers, and 12 have been #1 national bestsellers. The first was All the President’s Men by Bernstein and Woodward that was published in 1974. Since then Woodward has become the best-informed chronicler of the modern presidents from Nixon to Obama. Timothy Naftali is the co-director of NYU's Center for the United States and the Cold War and a clinical associate professor of history and public service. Naftali was Director of the Richard Nixon Presidential Library and Museum, a division of the National Archives and Records Administration. As the first director of the federal Nixon Library, Naftali oversaw the release of an estimated 1.3 million pages of presidential materials and 600 hours of Nixon tapes, and the creation of nearly 150 video oral histories. He wrote and curated the Library's widely praised multi-media Watergate Gallery, which opened in 2011. Co-sponsored by the Center for the United States and the Cold War at New York University.